This dtc is output when the sliding roof drive gear (sliding roof ecu) has not been initialized. Refer to dtc b2341 (see page rf-11). 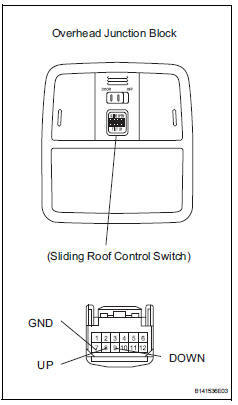 Check that the sliding roof drive gear can be initialized (see page rf-4). Ok: sliding roof drive gear can be initialized. Check the auto operation with the slide open and tilt up switch (see page rf-9). Ok: auto operation operates normally with slide open and tilt up switch. 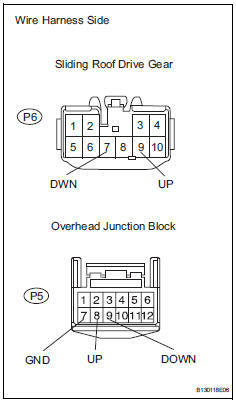 Disconnect the p5 junction block connector. Remove the overhead junction block.